Many of you are victims of suburban sprawl, also called urban sprawl. Don't worry if we term it "urban" and you're in a small town. Uncontrolled growth is similar in its causes, effects, and solutions. The definition we like is simply that the percentage increase in the amount of land used for urban (or town) purposes exceeds the percentage increase in the population. So within our definition, a town or city can grow its physical boundaries outward without necessarily sprawling, if the population growth is matching the physical growth. Below is a grid showing the various topic pages in this section; if you do not see what you need, use the site search box at the top of the page. This article resumes below the grid. No population growth means there is no reason for the boundary of developed land to be moving outward, in our opinion. Not all experts agree, and certainly folks commonly talk as if growth of any kind is the same. If people want to live in a rural neighborhood, that is a great way of life. They just should not expect urban services, by which we mean sanitary sewers, a municipal water system, and so forth. The effects of a low-density development pattern on built communities usually are negative. Some in the U.S. argue that suburban sprawl is a good thing because we live in America, and we need to have freedom to choose everything, even if it costs our town an arm and a leg to run a water line out there to our little slice of freedom. Actually in Europe or other places with a wonderful historic urban core, a rapidly broadening footprint of the urbanized area may be even more tragic, considering the devastating consequences of disinvestment in the city center that may follow. However, if you are a fan of efficiency and economy in government as well as in the business sector, you should be upset about an expensive real estate development pattern. Our top recommended books on the general topic are The Geography of Nowhere and Suburban Nation: The Rise of Sprawl and the Decline of the American Dream, a uniquely American perspective. Urban neighborhoods often neglect the connection between urban sprawl and community development. Central city residents fight a losing battle if your competitors for residents and sales tax dollars are on the outskirts of the region where the growth is. People stop maintaining their places in the city because they have started to daydream about moving out to the far edges of the suburbs where everything is shiny and new. Suburban sprawl even impacts the likelihood that we'll stay in good health, as our public health effects of low density page details. It's a true pocketbook issue. Many families have been finding that just because they could buy cheaper housing with more of the features they wanted already available on the outskirts of the city, that hasn't prevented their energy bill from soaring as they are stuck with long automobile commutes and no transit option. Suddenly location efficiency is on the radar of many home buyers, who can afford to be choosy right now. The causes of excess land consumption are really fairly simple. Cheaper land prices cause developers or households looking for housing sites go further from the urban core, where in theory, and usually in practice, the cost of land is highest. Throw in a streak of Yankee or Western independence, the extreme desire for privacy, and the obsession with collecting possessions, and you have a powerful force pushing people out of the city. Sprawl in small towns has accelerated, in part due to the trend away from Main Street mom-and-pop stores and toward discount stores. These discount stores naturally will want to locate on the highway and away from downtowns because they can obtain cheaper land without worrying about assembling and redeveloping numerous parcels. And since Americans are no longer willing to pay Main Street prices when the big discounter can provide the same item at a much lower cost, the spreading out of smaller cities is driven by retail trends as well as values of freedom, privacy, and newness. Some sophisticated but complex solutions have been devised. For example, we like transfer of development rights programs where all conditions for success can be met. In short, it would be great if most people could afford to choose to live closer together in a more compact urban form to prevent physical growth from getting out of hand. Addressing the effects of sprawl and a dispersed development pattern requires high-quality community networking among central cities, suburbs, and exurban areas. Suburbs share some common interests, and working on suburban sprawl tends to bring those to the forefront. If you are in a suburb that is the newest and best right now, but your metropolitan area continues to sprawl, soon enough it will be your housing that will be considered obsolete, your storefronts that will be vacant, and your sales taxes that no longer deliver the services. If you are in the central city, consider devoting about a quarter of the time and effort of your neighborhood association to the issue of promoting compact development. The cost of suburban sprawl is simply too high. Perhaps the most politically acceptable way to stop suburban sprawl is by promoting open space around the current edge of the built city. An actively sought and managed open space can be a positive rallying cry, and an engaging cause tends to be more riveting than constantly opposing what many people have been conditioned to see as progress. So just be pro-green space, rather than anti-development, which your opponents can too easily translate into anti-prosperity and anti-growth and anti-progress. Most people think suburban sprawl means ugly or cheap development, but they do not associate it with where they live. They think it has to do with bad architecture or something. 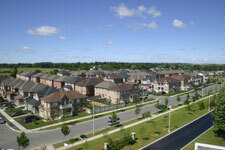 But the effects of urban sprawl include a negative impact on regional economics and the suburban landscape. Now did you think we would be talking about metropolitan politics on a website about community development? When we get our communities organized, we would like to think that everything in a neighborhood can be resolved without interacting much with the outside world. Neighborhood action requires so much effort that we're too exhausted to think about the dynamics of the entire city or metro region. 1. Regional competitiveness economically creates a robust or gloomy employment outlook, depending on how globalization, technology, and consumption trends have affected your region. Regions that are having trouble drawing in new residents tend to engage in economic sniping within the region so each suburb or neighborhood can continue to grow. The outer suburbs often feel entitled to growth, even if there is no metro economic growth. This behavior is the very essence of sprawl in a stagnant economy, whereas the same amount of growth and attitude toward it could be functional in a region that is producing net new jobs. 2. Obviously to improve the compactness of the development pattern, a region needs a formal and informal set of laws, rules, relationships, and customs that does a good job of solving problems, such as bad urban form, that go beyond political boundaries. The way a region goes about resolving issues that span boundaries is called regional governance, which shouldn't be confused at all with regional government. Rural areas may not identify much with the notion of region, but in the United States about 83% of the population lives within the MSAs. Metropolitan Statistical Areas are set up by the U.S. Bureau of the Census to show economically interdependent regions centered on a major city or small number of cities. Many rural counties are included in an MSA if a number of people commute to work in a nearby city. Another 10% live in micropolitan statistical areas centered on a city of at least 10,000 people. In the U.S. we could say that more than 93% are in a region. One of us grew up in a very rural area with a distinct identity of 19 counties. So the reality is that most of us live in a region. The remedy for any problems that suburban sprawl may cause usually depends on the region working together. That's why we hope you'll explore the pages that deal with regional economics and governance as you try to figure out how to cope with the expansion of your area's perimeter outward into the countryside. Just to compound the problem, now you have to start figuring out how you expect driverless cars and sprawl to interact in your region. That's for those who really want to get out in front of an issue, but we think city governments, regional agencies, and planning commissions and agencies need to start now.